00:10:00 Makes 24 servings, 1 treat (34 g) each. Makes 24 servings, 1 treat (34 g) each. It's Halloween and you need a sweet snack with kid-appeal. 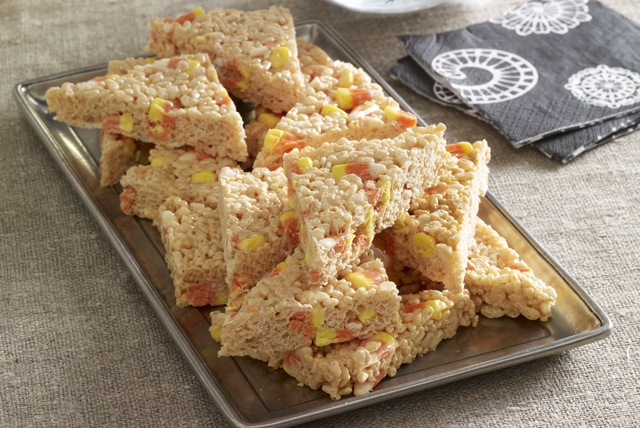 Try these marshmallow crispy treats with a seasonal twist. Microwave butter in large microwaveable bowl on HIGH 45 sec. or until melted. Add marshmallows; toss to coat. Microwave 1-1/2 min. or until marshmallows are completely melted and mixture is well blended, stirring in food colourings after 45 sec. Cool completely before cutting into bars; cut each diagonally in half. Substitute your child's favourite Halloween candies, such as Cadbury Fun Treats or Cadbury Raisins, for the candy corn. Serving Size Makes 24 servings, 1 treat (34 g) each.